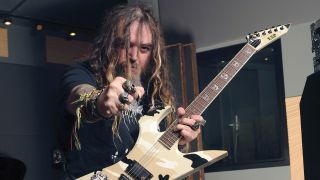 Today, GuitarWorld.com presents an exclusivestudio diary video from Brazilian metallers Sepultura. As we reported yesterday, Rock In Rio USA took place—and took over Las Vegas—over the weekend. Among the many acts on hand was Sepultura, who were joined by Steve Vai for several songs. Today, GuitarWorld.com presents the exclusive North American song premiere of the new Sepultura track, “The Age Of The Atheist.” Be sure to check it out below. From the opening riff of "World Scum," it's clear that Enslaved is a different kind of Soulfly album. Metallica have just announced several additions to their Orion Music + More festival, including Suicidal Tendencies and Sepultura. Soulfly Streaming New Song, "Gladiator"
Less than a week from the release of their new album, Enslaved, Soulfly are now streaming another new song, "Gladiator." Stream it below. Ahead of the release of their new studio album, Enslaved, Soulfly have just released a music video for their track "World Scum." Watch the Thomas Mignone-directed clip below. Last night in Prague, Sepultura guitarist Andreas Kisser joined Exodus on stage for a rendition of the band's classic track, "Piranha." You can check out fan-filmed footage of the performance below. Brazilian thrash icons Sepultura have just announced the departure of drummer Jean Dolabella after five years and two albums with the band. Video: Members of Anthrax, Sepultura Play "Refuse/Resist"
After a long absence from South America, Machine Head will return this fall -- along with Sepultura -- for several dates in Brazil, Argentina and Chile. Brazilian/American thrashers Sepultura are now streaming their new album, Kairos, in full at GuitarWorld.com. Brazilian/American thrashers Sepultura have justed a new track, titled “Mask,” here. The song is taken from their upcoming twelfth studio album, Kairos. Check out this exclusive video interview with Iggor and Max Cavalera, where the brothers discuss their Sepultura past and Cavalera Conspiracy future. Sepultura warriors reunite for Cavalera Conspiracy.